The W4-2 dual 4 qt. warmer is compact, portable, easy to maintain and inexpensive. Great for kitchens, buffets, counters, and dining rooms. Constructed with heavy-duty stainless steel for excellent durability. Inside liner made with stainless steel. Steel element support stabilizes heating elements and reflects heat toward food. 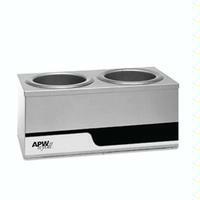 view APW Wyott warming equipment is backed by a 1-year parts and labor warranty, including our “Enhanced Warranty” service that replaces new units with certain product issues through the convenience of direct factory shipments.